When I’m working at our Lie-Nielsen events, we are asked a wide range of questions about hand planes. Most are somewhat typical, like: “Can you show me how to sharpen a plane blade?” One question that does seem to resonate with a fairly large number of woodworkers, and perhaps even more for those just starting out, is which are the first three planes one should buy for their toolkit. There is no hard and fast rule which three are best, but I’ll share my thoughts on this question. I lean towards a #60 1/2 Low Angle Block Plane (swapping out for a 60 1/2RN if the customer is planning to do a lot of mortise and tenon work), a #62 Low Angle Jack Plane, and a #8 Jointer Plane. These three planes together provide a good base for working wood. So why did these make my top three? Well first, I think every shop should have at least one really good Block Plane, as they are go-to tools for such a wide range of applications. From a quick chamfer, to breaking the edges on a project, to touch-up smoothing a small area on a project that may not be quite as flat as you’d like. And with the short body length, you just might get away with a few passes with this plane instead of coming back in with a large smoother, and ultimately having to flatten the piece quite a bit for the smoother to “reach” the problem spot. A couple of nice things about the #60 1/2 is the heft of the tool, which equates to mass that helps in planing operations, and the adjustable mouth that only requires a spin of a knob to modify. If I’m changing from some easy-to-work wood like Walnut, over to some tougher curly Maple, I’ll usually close the mouth down to the point where the shaving just has room to pass through. This is much more critical on woods prone to tear out. If on the other hand, I need to take a bit heavier shaving, I’ll just open the mouth as required. I also use this quick adjustability every time I sharpen the blade. After sharpening the blade, I’ll open the mouth up all the way, so I can reduce the chance I’m going to accidentally bump my fresh blade into something that would damage it while positioning it in the plane. My next plane could be seen as a compromise, but I really think it has so much going for it, it makes more sense to think of it as a multiplier. 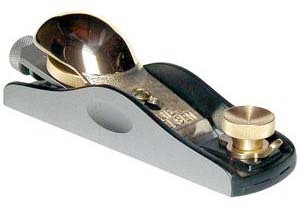 I’m talking about the Low Angle Jack Plane. 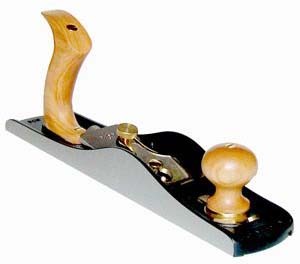 This sized plane can play a range of roles, from smoothing, to more traditional Jack Plane duties, shooting plane duties, and if you are working small scale work, even as a short Jointer. This plane has the blade bedded at 12 degrees, and the bevel is facing up. With this setup, it is easy to modify the honing angle of the blade to accommodate straight grained woods all the way to super figured hard woods. Since the bevel is up, the honing angle directly affects what the wood “sees”. When using this plane for smoothing or jointing, I’ll adjust the mouth so the shaving will just fit through, and use either a slightly cambered blade or one with the corners relieved. When used for shooting, I use a blade honed straight across, as I’m always working on boards that are thin enough so the blade’s reach is higher than the top edge of the board. For more traditional jack plane duties, I prefer a blade with more camber than I use for smoothing. Since I’m removing more wood with each pass, I open the mouth to provide sufficient clearance for the expected thicker shavings. Lastly, the full sized #8 Jointer Plane is a tool that is not easily replaced. 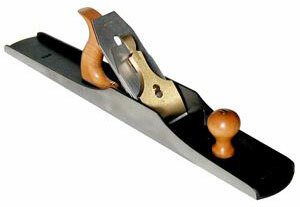 The level of flatness a Jointer plane can provide is limited by the length of its sole. A Jointer plane ultimately rides across the tops of any undulations, much like you might imagine a large ship spanning across multiple waves. A longer sole will span wider undulations, and obtain a flatter surface. With its 24” length, it is capable of handling flattening duties on relatively short pieces as well as lengths that include the largest most woodworkers would consider working. I recently used my #8 to flatten the top of my workbench, which it handled easily. The #8 Jointer Plane weighs in at 10 lbs, which sounds like it would be difficult to handle. Surprisingly, the weight and mass of this tool works in your favor. It’s not hard to initiate movement on this plane, and once moving, even easier to keep moving through the cut. I usually keep a small block of paraffin near my bench, and that facilitates an even easier time using the Jointer Plane. A very light swipe of paraffin along the sole of the plane body makes all the difference. A tip I regularly provide at our events is to make sure you are certain that you are holding onto the plane tightly when using paraffin for the first time. Initially, it can truly feel as if the plane will race away from the user. These three planes are a great place to start, and can handle many of the tasks that woodworkers need for their projects. I suggest adding specialty planes to your core kit as projects dictate. With this strategy, none of your planes should gather dust for long, as they are all truly users. I hope to see some of you at our upcoming events, listed on the Lie-Nielsen website. Feel free to contact me at lee@lie-nielsen.com if you have any questions, or if you have suggestions for future articles you would like to see.